This article is about the city. For the region of Tanzania, see Iringa Region. For the municipal administrative district, see Iringa Urban. For the rural administrative district, see Iringa Rural. 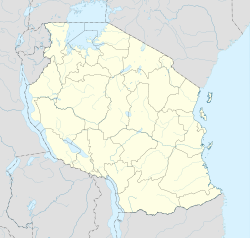 Iringa is a city in Tanzania with a population of 112,900 (as of 2004[update]). It is situated at a latitude of 7.77°S and longitude of 35.69°E. The name is derived from the Hehe word lilinga, meaning fort. After their stunning defeat at Lugalo by the Hehe, led by Chief Mkwawa, the Germans built a military station at 'Neu Iringa' to avenge the death of their commander Emil Von Zelewski and to teach the Hehe respect for German authority. The fortress and headquarters of Chief Mkwawa was in the nearby village of Kalenga, Alt Iringa. The town stretches along a hilltop overlooking the Ruaha River to the south, and spreads along ridges and valleys to the north. The altitude of the town's environs is more than 1,550 metres (5,090 ft) above sea level. The months of June, July, and August can see low temperatures near freezing. The Tanzam Highway passes through the valley below the town; the highway distance from Iringa's limits to Dar es Salaam is 502 kilometers (312 mi), via Morogoro. The Isimila Stone Age site, which lies about 20 km (12 mi) to the southwest, contains archeological artifacts, particularly stone tools, from human habitation about 70,000 years ago. Iringa Urban Municipality is the administrative designation of the Municipality of Iringa. Iringa has several institutions of higher education, including Tumaini University, Iringa University College, Mkwawa University College of Education (a constituent college of the University of Dar es Salaam), and Ruaha University College (a constituent college of Saint Augustine University of Tanzania). Schools include Tosamaganga High School and Ruaha Secondary School..
Iringa is famous for its woven baskets, made from local reeds. The baskets are used across Tanzania and also exported internationally. The city is also well known for the award-winning Neema Crafts Centre. Iringa municipality has six FM radio stations: Trap Gang Radio, Ebony FM, Country FM and Nuru FM (youth entertainment and commercial radios), Overcomers Radio and Radio Furaha (Christian stations), Kibra Ten Radio (a Muslim station). There are other radio stations elsewhere in Iringa region, such as Kituro community radio in Makete and another FM radio station in Njombe. Iringa has one TV station: Municipal Television, a multi-age TV station with diversified programmes. ^ Africa, Nomad. "Iringa". nomadtours. Retrieved 24 May 2013. Wikivoyage has a travel guide for Iringa.